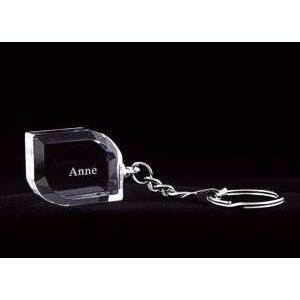 A new take on the rectangular shape, the Crystal Angle-Facet Keychain will blaze in the light! 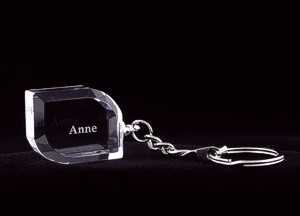 Perfect for personalized or corporate gifts, these multi-faceted Keychains are light and stylish. Laser engraving will reveal a frosty white tone for excellent contrast. All of the Crystal Keychains arrive complete with a beautiful silver tone split-ring and chain. This will surely become a popular gift item! Crystal: 1-1/2" x 1-3/16" x 5/8"